Review: Vinyl Siding Cleaning results. 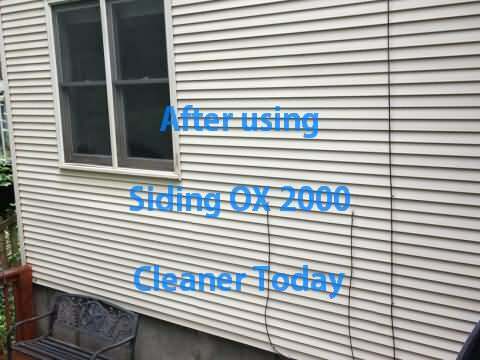 Siding Cleaner works pretty good overall. Before and After Picture show the improvements. 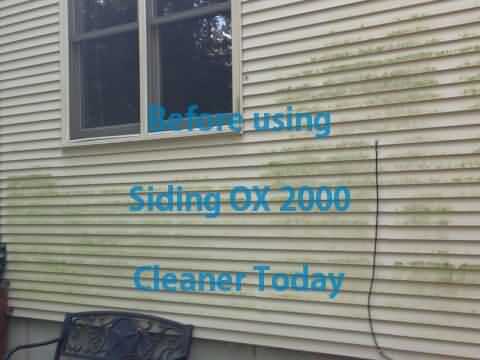 The siding cleaner works pretty good overall. I Followed the directions and let it soak for 25 minutes after application, then used the car wash brush just before washing it off with hose (on Jet spray). Got everything off that way. I expected it would take more scrubbing but it really was just a matter of brushing before rinsing. The difference was very apparent, just look at the Before & After photos. All in time took me less than 90 minutes. Q: Can Siding OX be discarded in a septic tank? Sidebar question, best way to dispose of remaining OX cleaner? Is it safe to pour in toilet and flush rather than pour into environment? Yes, Siding OX can be safely discarded in both Septic and Sewer systems.